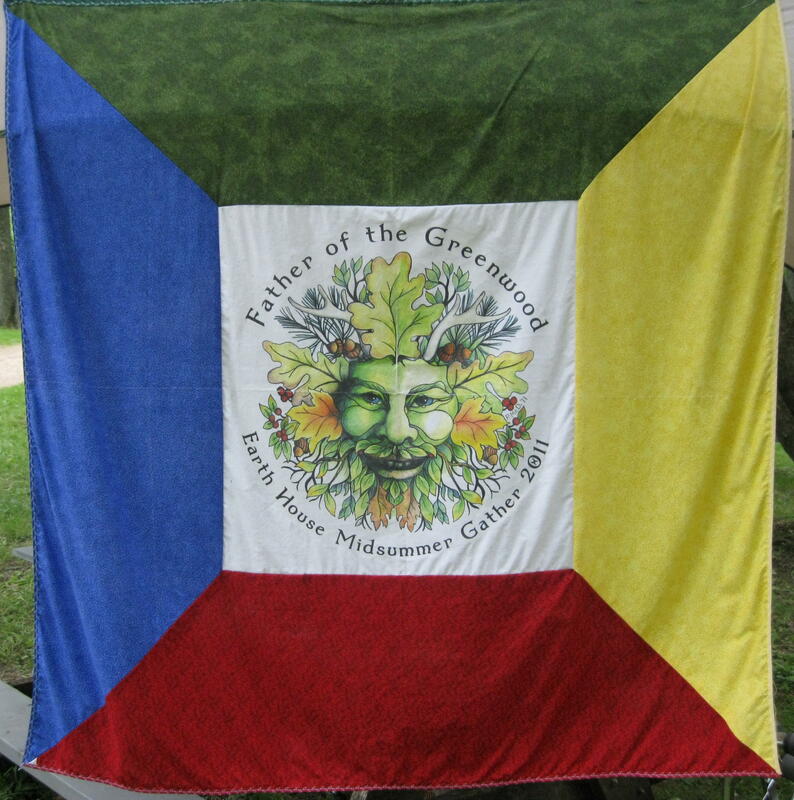 The Earth House Midsummer Gather (EHMSG) was last week. This was its 11th year. This year’s EHMSG had 78 people in attendance, 13 of whom were children, and about a fifth of those in attendance were first time attendees. The largest attendance ever was 86 in 2003. “I love it. It makes me happy. It’s a comfy little festival. It’s like coming home,” said Estelle Daniels, who’s been to every Earth House MSG. The gather has many long standing traditions. Since 2005, they have had the same opening and closing ritual, in which wards are put up and wards are taken down respectfully. There has always been two feasts: one celebrating midsummer, and a “barbarian feast,” – just because we have so many excellent cooks. There’s often been a Bill the Cat (Discordian) ritual, and a bardic circle. Increasing a sense of community has been part of the tradition since the beginning, with the encouragement of people coming to the community fire rather than – or in addition to – individual camp fires. In the second year of the gather, and ever since, they have had a chocolate ritual. In 2005, they began the brewing contest. 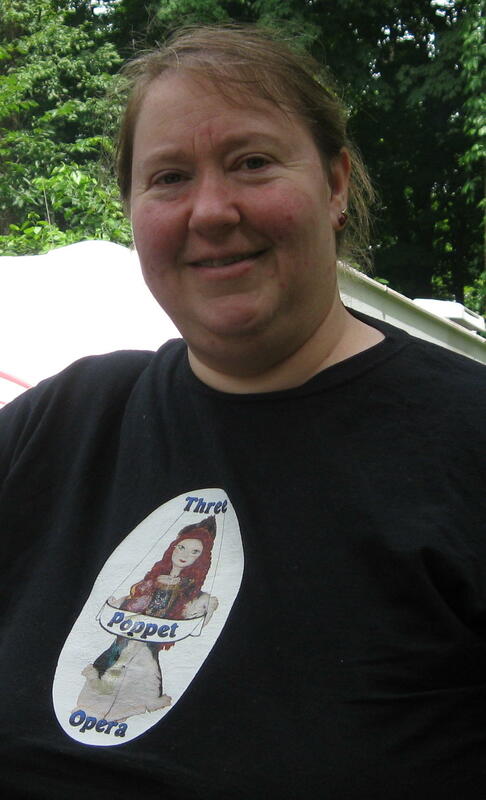 Pagan University began in 2005 as ministerial training and focused on those topics, but in 2006 Professor Murphy Pizza transformed it into a discussion of advanced topics of interest to Paganfolk. In 2006, Kari Tauring came and began a staving tradition amongst participants. Also in 2006, the Talentless contest began; an event of great importance to the Vorderbruggen family. Keith Vorderbruggen has always been the judge of the Talentless contest, with the standing rule that the judge can be bribed. Dawn, who’s last name is now Vorderbruggen, tells the story, “The judge declared himself bribable, so one of the contestants, namely me, bribed him with a big kiss.” Of course she won, but Keith continues the story, “She felt so guilty about the bribe, so she turned down first prize.” They married September 22, 2007. Many friends from the Earth House community attended the wedding. That sense of community continuing beyond the festival is a significant part of EHMSG. Earth House sponsors Coffee Cauldron, which fits perfectly with their mission of encouraging community, and also serves as a place for many MSG attendees to gather between midsummers. 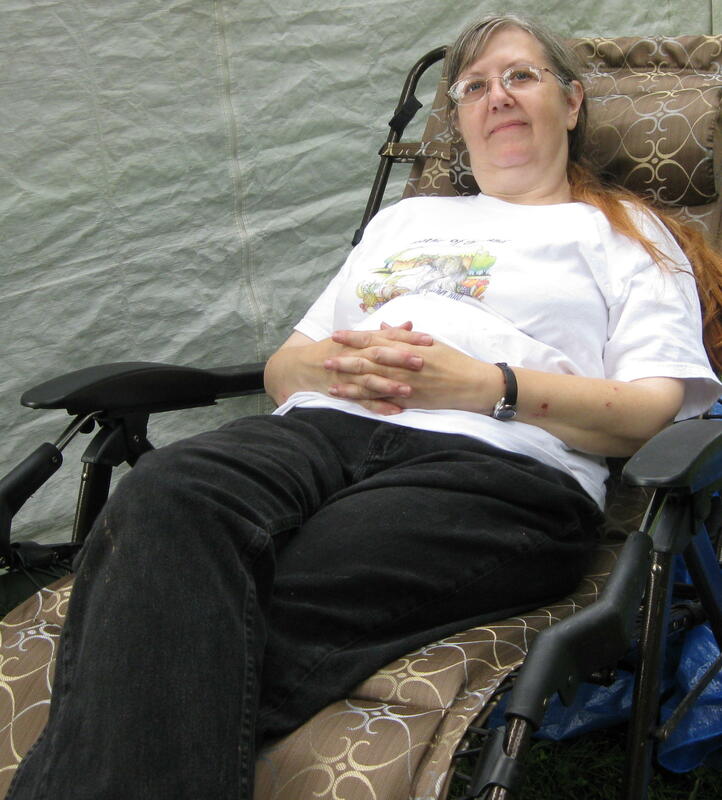 They also maintain a special email list specifically for festival attendees, created by Peggy McDowell. The McDowell family has been coming to EHMSG since the beginning. They live in rural Wisconsin, and their children have grown up attending the gathers. When their daughter got sick, energy was raised at Coffee Cauldron and sent to her. Also, more EHMSG attendees visited her in the hospital then her own local friends. Otter came up with the name because she saw the different Pagan religions as earth-based, and they wanted a place of their own, so it became Earth House. Two previous attempts at a Pagan community center, Omphalos and the New Alexandria Library, both had financial problems, and space issues. The first Earth House meeting took place in the New Alexandria Library and was attended by nine people, most of whom are still active with Earth House. By the end of the first year, they were using the freshly-baled hay as targets (using discarded tent-poles as javelins), and afterward everyone cleaned out whatever was left in their coolers and they gathered for a group meal. This became known as Barbarian Feats and Feast. The tradition of the Barbarian Feast still continues on the last night of the festival. By the third year, with 86 people in attendance and the event threatening to climb over the 100 mark, a need for a higher level of amenities/services than was easily provided, and an aversion to use community funds to improve private land, the gathering moved to a professionally managed camp ground. Eagle Cave Campground has been the site of EHMSG since 2004. Eagle Cave was also an early site for Pagan Spirit Gathering (currently one of the largest pagan festivals in the nation) and Avalon. 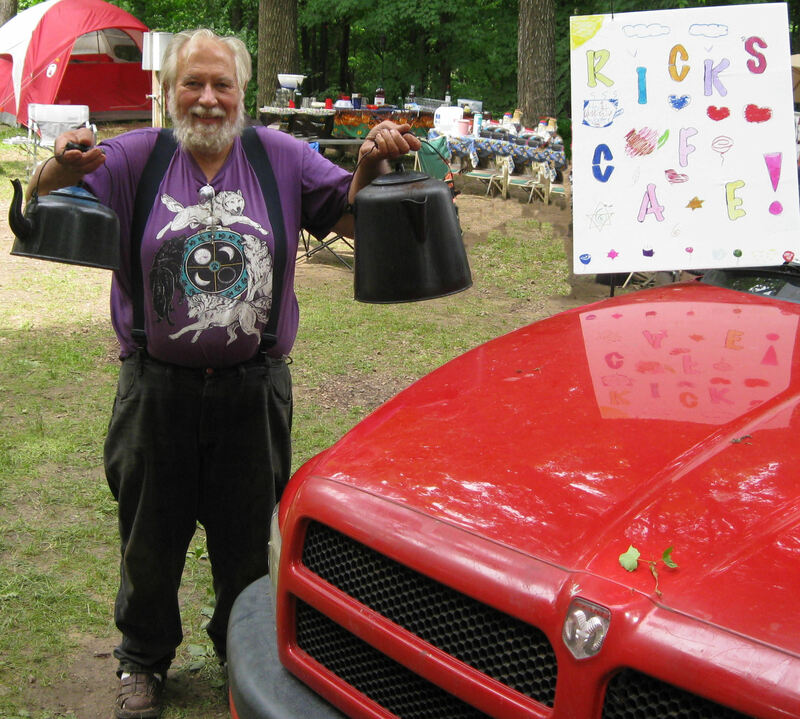 Lou Gastuch, facilities coordinator for the gather and Community Services officer for Earth House, first came to Eagle Cave for Avalon, and loved the camp site. Eagle Cave Campground has electricity and water at every camp site, people can park at their sites (provided there’s room), there is a clean bath house with hot showers and flush toilets, and there are five reasonably-priced sleeping cabins with air conditioning. Under the campsite, there is also a cave which was the first commercialized cave in Wisconsin, with a large deposit of onyx. This year’s musicians, Folk Magic, performed in the cave at a previous gather and loved the sound, describing it as being like performing in a cathedral. Also, with their previous festival experiences, the owners are used to dealing with Pagans. The first Year EHMSG was at Eagle Cave Campground, the owners were told that the nightly ritual would begin at 7pm, so they could come into the camp anytime between 5pm and 7pm to do whatever they needed to do. Used to the “Pagan Standard Time” of previous groups, they started one of the trash pick-up runs right at 7pm, and were very surprised to see the festivants already circled up for ritual and not running on Pagan-standard-time. EHMSG is also known for a lack of in-fighting at the festival. As Neva put it, “There’s very little drama at the gather.” Because of this, for the past 11 years, Earth House has mostly been guided by the same core group of people. To which John Stitely said, “We haven’t had a single security issue all week. So long as this continues, he’ll continue having a job.” John Ossian has volunteered as head of security since the second year of EHMSG.